Is it worth to buy Retrax Pro? Lets decide this in this RetraxPro review and see the alternatives. What to expect from RetraxPro and Who is it for? How to install the RetraxPro? What is the alternative to RetraxPro? The RetraxPRO by Retrax is a retractable Tonneau Cover for truck beds. It's a durable cover made of sturdy LEXAN material with UV treatment. The main function of RetraxPro is to protect any items hauled/stored on your truck bed. It's ideal for safeguarding such items from dust/dirt, water, and even sunlight. This Tonneau Cover is also a stylish option that adds some pizzazz to the overall look and feel of your truck. Retrax Company has over two decades of experience producing Retractable Truck Bed Covers. This is a plus over other startup/generic companies that have less experience and/or cheap products. Various versions of the Retrax Pro are available. That includes a glossy finish and matte finish. You can also select the truck bed cover with or without Stake Pocket Access. RetraxPro is made from heavy-duty slats that are from aluminum and made to retract without wearing out, freezing or trapping dust. The low-profile design looks like a front cover that blends well with the truck bed cover. It has a bed cover that can be clamp-on and it can be installed by anyone with basic tools. Has ball-bearing rollers that are sealed and they are mounted onto the support beams that allow the truck bed cover to close or retract effortlessly. The truck bed cover can be locked open in any type of position together with the rail to allow hauling flexibility and convenient use. The RetraxPro has no moving parts that could fall off, freeze, fail or jam. It can also withstand any type of weather condition. The ideal customer for the RetraxPRO is truck owners who are willing to spend a higher price tag for a high-quality Tonneau Cover. 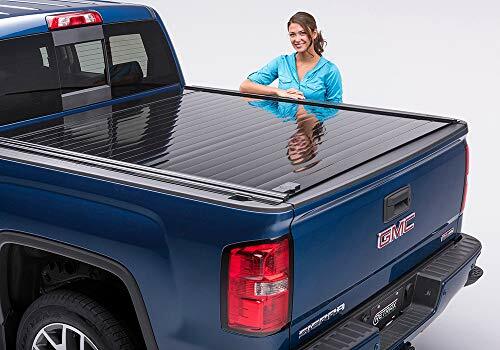 It's a wise choice for customers who want to store, organize, and protect items on their truck bed combined with the ease of use of a retractable cover. Although it is not a budget-friendly truck cover, you will definitely benefit from the features as it could help you keep your unit safe. It is a part of the Premium Aluminum Series of Retrax covers and made from industrial aluminum slates that assures ruggedness and strength. It also looks good on any pick-up truck as it blends in with any color and any model. If you're looking for an alternative to the RetraxPRO, you have several options. One of the top ones is the GatorTrax Tonneau Cover. This is a great retractable tonneau that is made of the highest quality material. This truck bed cover with its amazing low-profile design will look great on your truck. The GatorTrax Tonneau is made out of a material called Lexan and it is the same material used in cockpits on fighter jets. The Lexan polycarbonate is not only lightweight, it is also durable and it makes it UV rays protected, moisture protected and it can also withstand harsh weather conditions. Water penetration can be prevented because of the piece construction at the top. This retractable tonneau cover is a cover that is maintenace-free, it uses a ball-bearing mounted seal on to aluminum support beams. This bed cover’s ball-bearings allow the truck bed cover to open and close easily. The bed cover’s canister has a track system that is spiraled with no moving parts, so you do not have to worry about it getting jammed while you use it. It also has rails that are clamp-on so it is easy to install with no cutting or no drilling required. It is made in the United States of America and it is very durable and can withstand the elements and it comes with a lifetime warranty. We've just reviewed the RetraxPRO Retractable Truck Bed Cover. So what's the verdict? All things considered, the Retrax truck cover is a good option for various reasons. It provides a unit that's sturdy and more durable than soft covers. The heavy-duty aluminum provides a more durable and sturdy option vs. soft covers. You can also lock the retractable cover, which provides extra security over those options. In fact, you can lock the cover in any position. This retractable cover also offers protection to your truck bed. That includes protection from the elements like water/rain and UV rays. This is critical in order to extend the unit's lifespan. The RetraxPRO also offers other features like an eye-catching low-profile design, sealed ball bearings, and better fuel mileage. The main "drawback" of the Retrax Pro is the high price range. However, if you consider the high value you get with this truck bed cover, it's worth it. Retrax has you covered!